Ammonium Bifluoride is a white crystalline solid. It is soluble in water. It is noncombustible. It is corrosive to aluminum. It is used in chemical analysis, in brewing, and as a preservative for wood. 25kg/bag, 50kg/bag, 1250kg/bag, lined with PE woven bag/paper-plastic composite bag. When dissolved in water, cooling takes place. Material is Hygroscopic at 50% humidity. *Assay: Weigh accurately about 1.0gm of Ammonium bi fluoride sample. Dissolve it in 100ml distilled water. Titrate with about 1N NaOH. Use Phenolphthalein as indicator. End point is Colourless to Pink. Ammonium bifluoride is a white crystal salt chemically when ammonium bifluoride comes in contact with water resulting with the formation of HF. It is used to brighten aluminum and other metals. We are also keeping ready stock of Potassium Bifluoride. We provide all types of Fluoride Chemicals. As an additive to sand in the process of casting magnesium and magnesium alloys, mordant for aluminium, Aluminium anodizing (Metal labels). Ammonium bifluoride also used for brightening of aluminium, purifying & cleansing beer dispensing apparatus, tube, sterilizing dairy & other food equipment, Glass and electric lamp bulb industry. Ammonium bifluoride also used as an ingredient of the etching mixture (Glass Frosting), porcelain industries. Ammonium bifluoride for the removal of iron stains (laundry sour). Ammonium bifluoride lab production of HF. Bactericide in sugar industry for checking the invisible loss of sugar due to bacteria. 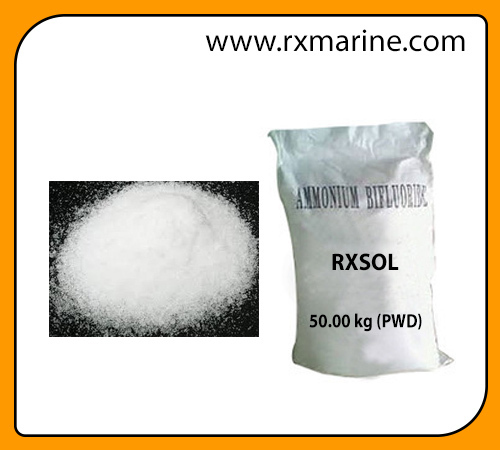 Ammonium bifluoride used as Silica scale removal in boilers & evaporators. Wood preservatives. In Electroplating Industries for pickling of metals (e.g. Steel sheet prior to Nickel plating, Zinc prior to Copper plating), In nuclear chemistry for the separation of Uranium from Iron, Vanadium, Beryllium and Zirconium. RXSOL Fluoride, are counted amongst the leading manufacturer, supplier, wholesaler and exporter of Fluoride Chemicals, Cryolite Chemicals and Fluoborate Chemicals. 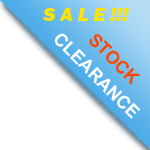 These products are recognised for their accurate composition. We are manufacturer, supplier, wholesaler and exporter of Sulphate Chemical, Lithium Chloride and Potassium Metaborate. All these products are processed with top-grade ingredients in order to ensure their compliance with the international quality standards. These products are highly acclaimed by our most valued clients for their excellent finish, unique formulation, purity, longer shelf life and perfect finish. Owing their numerous other features, these products are highly valuable for pharmaceutical, chemical and bio-technology industries.